Welcome to “Mentoring Mayhem,” much like speed dating in the architecture world. 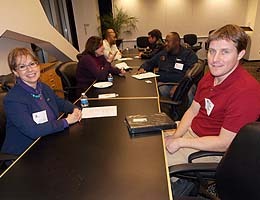 The event presented by the Hampton Roads Chapter of the American Institute of Architects connected Tidewater Community College students with professionals in the field for an intense exchange of ideas. Mentors shared advice on portfolios, theses, educational paths and jobs with students who hopped from professional to professional for one-on-one conversations. The event was held at the offices of H&A Architects and Engineers in Virginia Beach. Second-year TCC student LaDonna Simpson appreciated the opportunity provided by TCC Professor Sergei Dolgalev, who encouraged several of his students to attend. After taking one drafting class at the college, Simpson fell in love with the field. Simpson wants to renovate older homes and learned about the importance of mastering Revit Software. Like Simpson, TCC student Michelle McDaniel, who also attended the event, plans to transfer to Hampton University to earn her master’s in three years. Her vision is to move to a Third World nation and build there. Nigerian-born Babalola Fadahunsi also appreciated the advice he received about the program at Boston Architecture College and its multitude of online options. Though he has a degree from Nigeria, he enrolled at TCC for the 36-credit Architectural Drafting and Design Technology certificate.